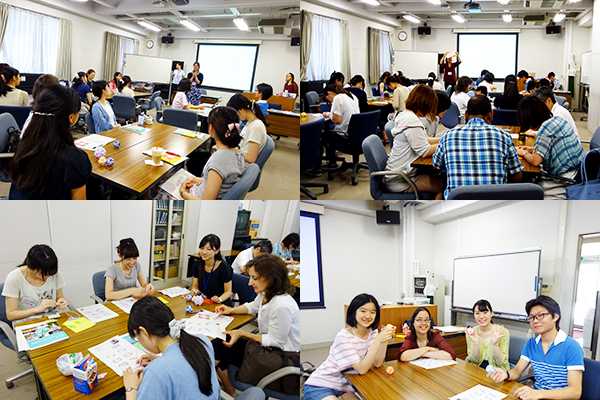 On July 15, we held the third session of origami workshop. The title of the presentation is “Computational origami – origami with computer programs”. I explained how we can design an algorithmic method to perform origami geometric construction. Origami geometry is based on 6 fold operations defined by Huzita. The operations state possible alignments of points and lines on origami paper. Origami geometric construction proceeds stepwise where at a single step we fold by solving one of these operations. Solving the operations is reduced to solving equations of degree up to 3, which make origami a powerful geometric tool that can solve some of the impossible Euclidean constructions, such as trisection of an arbitrary angle. I showed a demo on how to solve such problem using computational origami system, called Eos (Ida et.al., 2006). The algebraic definition of origami construction in Eos allows us to prove properties of correctness using Groebner basis method. After the presentation, we folded a 3D geometric shape called“stellated octahedron”. Each of us assembled 12 modules without glue.Examining the shape of stellated octahedron is an important step to understand how the assembly works.